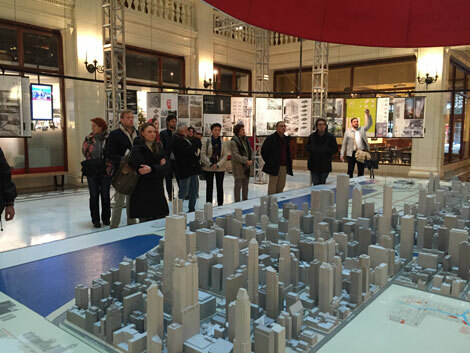 The Chicago leg of the regional city tours began on a cold and blustery morning at the headquarters of the Chicago Architecture Foundation (CAF) in the historic Santa Fe Building. As people trickled in, they had the opportunity to peruse the CAF gift shop and examine a scale model of downtown Chicago. Additionally, participants viewed entries for the ChiDesign Competition – a theoretical design for an architecture education space featuring CTBUH headquarters – which were on display around the model. The Chicago Tour attendees gathered at the Chicago Architecture Foundation (CAF). The view down the main branch of the Chicago River with the Trump Tower taking center stage. 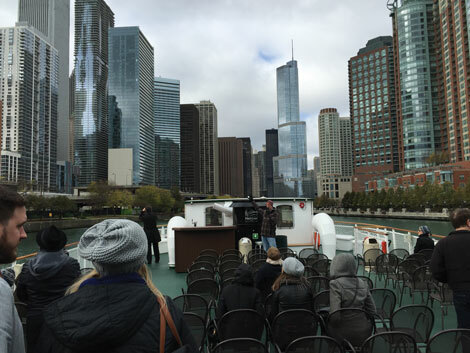 After a brief introduction to the CAF, the tour group ventured outside to walk down Michigan Avenue towards the Chicago River for a CAF-sponsored architecture boat tour. Along the roughly three-quarter-mile (1.16-kilometer) trip, the group had the opportunity to witness Chicago at street level on the city’s most famous avenue. This ground plane introduction to the city was augmented by the Chicago River boat tour, which took the group down the three branches of the river. Throughout the tour, a docent from the CAF discussed the architecture around the river as well as its historical significance. Despite being the coldest tour of the year to date, all agreed that it offered an insightful and thorough introduction to the wide range of architecture featured throughout the city. 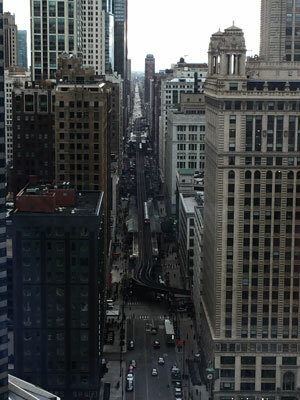 The view down Wabash Avenue from a Trump Tower suite. Following the CAF boat tour the group was met at the riverside dock by representatives from Skidmore, Owings & Merrill (SOM), who helped organize the rest of the day’s activities. The architects from SOM led the group across Michigan Avenue to the base of Trump International Hotel & Tower. Outside the building, they gave a brief introduction to the tower, which they had worked on directly. Of special interest to many was the system of staged openings that occurred throughout the building as successive sections were completed. This method was employed to maximize the building’s economic benefits as it was completed during the height of the global recession. The architects also discussed the various structural elements in the building as well as its relationship to the surrounding city, including a redeveloped riverfront space. Once inside the building, the group toured several back-of-the-house spaces, including an underground entrance and an engineering and maintenance room that featured exposed structural elements. Additionally, the group was given access to a hotel suite with views along the Chicago River and down the Wabash Avenue corridor. Next, they toured the restaurant and exhibition spaces and concluded with a visit to the building’s lobby, where the guides from SOM answered any remaining questions about the building. Due to security concerns, the group was only able to tour floors 28 and lower, as the remaining upper-floors house luxury condominiums. After a short bus ride across the central business district, the group returned to the Santa Fe Building, which is also home to SOM’s Chicago office. There, a catered lunch awaited the now hungry tour group. Over lunch the group learned about SOM’s role in the Chicago area action plan that seeks to create a city-wide sustainability agenda. 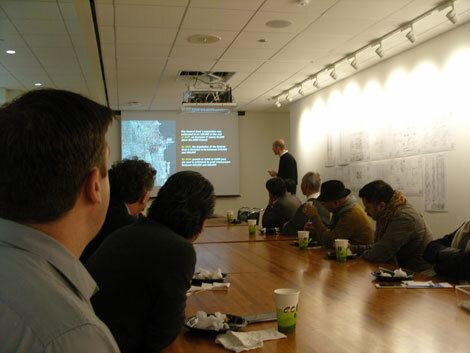 Additionally, a presentation focused on the development and history of Willis Tower and the John Hancock Center, both designed by SOM, in anticipation of visiting the sites later in the afternoon. After lunch and the two presentations, the group went by bus to the Willis Tower, which is the tallest building in Chicago and was the tallest building in the world for nearly 25 years from 1974 to 1998. In the lobby, they were greeted by a building manager who acted as a tour guide throughout the building. After piling into a massive service elevator, the group traveled to the 82nd floor, which operates as a showroom of sorts for potential office tenants. The floor featured bare white walls and floors and nothing else. Although that might seem like poor fodder for a tour, all were mesmerized by the surrounding views, which stretched toward the horizon in all directions. Attendees enjoy the picturesque view from the Willis Tower. A presentation on SOM’s role in developing city policy. 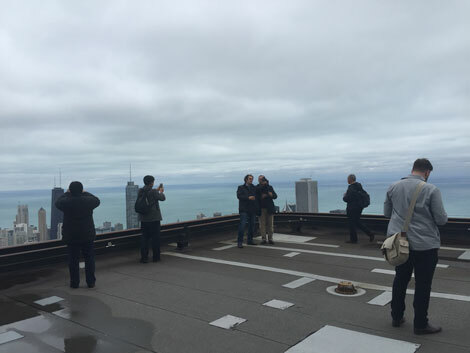 Once everyone had acquainted themselves with their surroundings, the tour moved up to the 90th floor for the real show-stopper – a trip onto the building’s roof. Before venturing outside, the group gathered in a mechanical room housing the original window washing and façade access equipment. On the roof, they again had time to take in the surrounding views and snap as many pictures as possible. This was also deemed an appropriate point to take a group photo. Back inside, the group traveled to a lower-level mechanical floor which featured heating equipment and exposed structural elements. 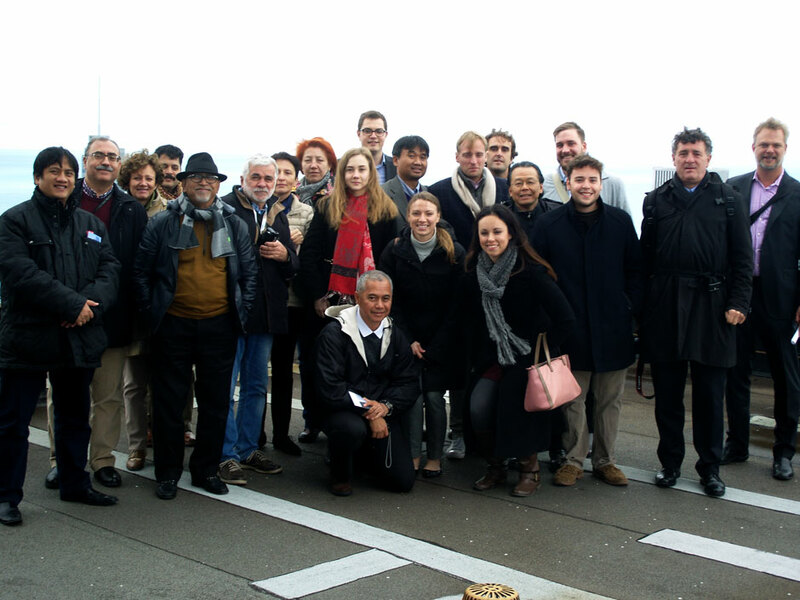 After a short Q&A session about the contents of the mechanical floor, the group was given the opportunity to travel back to the top of the structure for a free visit to the observation deck, where the tour concluded. The lobby of the UBS Building, designed by Goettsch Partners. Once back on solid ground, the group again boarded a bus for a trip across downtown to the John Hancock Center, which would be the final building tour of the day. After gathering in the recently redesigned lobby, the group traveled by freight elevator to the mechanical and service floors at the top of the structure. Because of its height, the Hancock (along with the Willis) houses many of the broadcast equipment for the city’s radio and television outlets. The group learned about the process of powering-up broadcasts to be distributed to a 30 mile radius, and they were able to view broadcast equipment for radio and television broadcasts in both digital and analog formats. Unfortunately, due to construction on the broadcast antennae, the group was unable to go onto the building’s roof. The final stop of the evening brought the tour back to the Santa Fe building, which is conveniently also the home of Goettsch Partners, who would help organize activities for the second day of activities. Here, the group was able to rewind with a cocktail gathering organized by the architecture firm. The second day of the tour began on a much nicer morning with a visit to the under-construction 150 North Riverside building by Goettsch Partners. The group gathered on the Randolph Street Bridge adjacent to the structure, where they were met by Joachim Schuessler, Senior Associate, and Scott Seyer, Principal, of Goettsch Partners, who would be guides for the morning’s activities. The group discusses the design of Aqua Tower from its outdoor podium amenity space. Although the group could not enter the construction site due to the volume of work at the time, Schuessler and Seyer gave an in-depth description of the building’s design and inception as they walked the group around the perimeter of the site. The building’s structural design was of particular interest to the group, as its core can only occupy less than one third of the site due to unique and unavoidable constraints. It uses large V-shaped mega-columns to cantilever the building over an active rail line and a city-mandated pedestrian walkway. While Schuessler explained the structural elements of the tower, Seyer detailed the long path to development due to the peculiarities of the site. Because of the Amtrak trains that run through the site, the developers had to work directly with the organization to get approval on the site. Seyer discussed the difficulties of this working relationship with candor. After a thorough examination of this site, the group continued on to view several completed, grade-A office spaces designed by Goettsch. 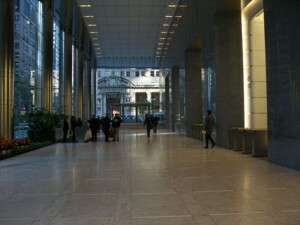 Just a minute’s walk from 150 North Riverside was 155 North Wacker. Here, the group had the opportunity to marvel at the expanse, multi-story lobby, while Seyer described the design intent behind the building. He focused on the decision to incorporate an arcade, as well as the challenges behind cladding the ceiling with heavy tiling. Due to security concerns in the functioning office building, the tour was unable to venture past the lobby, but the visit offered an opportunity to get a better understanding of the design requirements for the city’s prestige corporate addresses. 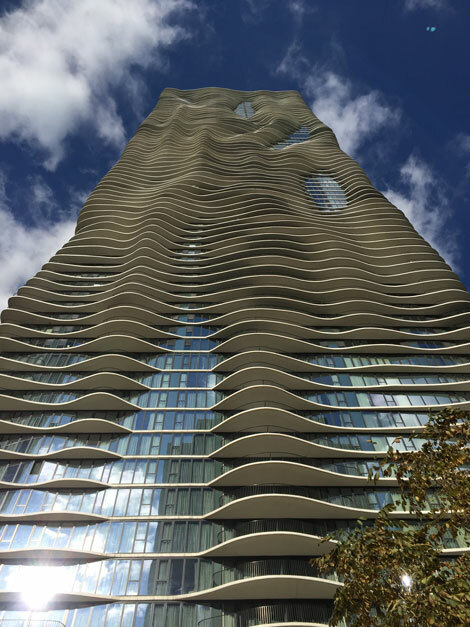 The contours of Aqua’s balconies are apparent from its podium. The next stop, UBS Tower, was also designed by Goettsch. Completed in 2001, it is slightly older than 155 North Wacker – completed in 2009 – and thus offered the tour a chance to see how grade-A office space has evolved in the 21st Century. Again, the tour only covered the lobby of the building, but Seyer extensively detailed the specific design elements, including expansive glass mesh walls, which he explained were designed to expand and contract based on temperature, pressure, and climate. At this point, the group parted ways with Seyer and Schuessler after graciously thanking them for their time. With some time to spare before their next stop, the group made an impromptu stop at Millennium Park and the brand-new Maggie Daley Park. This stop afforded the opportunity to visit some of the most compelling tourist attractions in the city, as well as excellent views of the surrounding skyline. Many first time visitors were surprised to learn discover the extensive parkland abutting Lake Michigan, while return visitors were intrigued by the activity-focused design of Maggie Daley Park, which features extensive play areas, rock climbing walls, and an ice-skating ribbon that doubles as a jogging path in warmer months. 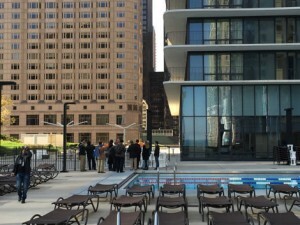 The final leg of the two-day tour brought the group to Aqua, an 86-story residential and hotel building in the Lakeshore East development designed by Studio Gang Architects. There, they first met with representatives from Magellan Development, who are responsible for developing Lakeshore East, one of the largest private developments in Chicago history. A lunch presentation focused on the history of Lakeshore East as well as the proposed Vista Tower, which is also designed by Studio Gang. If completed as planned, Vista will be the third tallest building in Chicago and the tallest building ever designed by a female-owned architecture firm (Aqua currently holds that distinction). The presentation by Magellan focused on the inception of the building along with the work that they have put in to incorporate community feedback. Because of the scope of the tower and its location at a complex node of infrastructure, its construction will include significant changes to the surrounding built environment. With lunch complete, the group was introduced to architects at Studio Gang who described the design of Aqua and offered a tour of the building’s expansive podium and amenity space. From the podium, the group was able to look onto the greater Lakeshore East development while exploring the extensive space. With the sun shining, they had one last opportunity to look out onto the expansive skyline surrounding the building as the day’s activities came to an end. As participants began to trickle away, some stayed behind to enjoy the moment. A group photo from the roof of the Willis Tower.